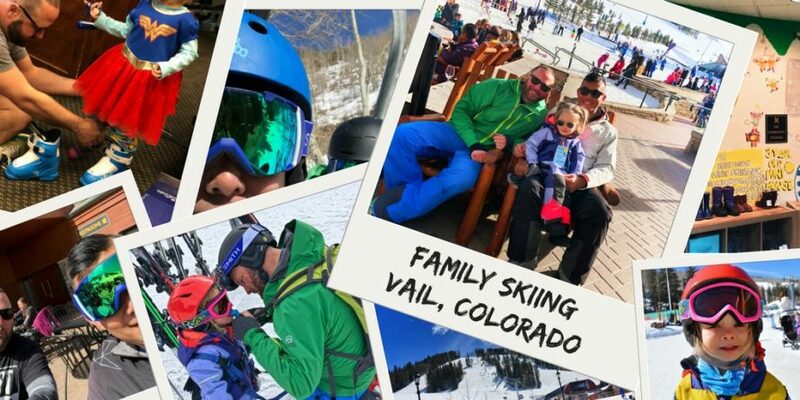 Why choose Vail, CO for family skiing? You’re there! Time for family skiing in Vail! When you hear the name Vail you may envision the rich and famous decked out in Mont Blanc outfits, skiing among picturesque ski chalets. 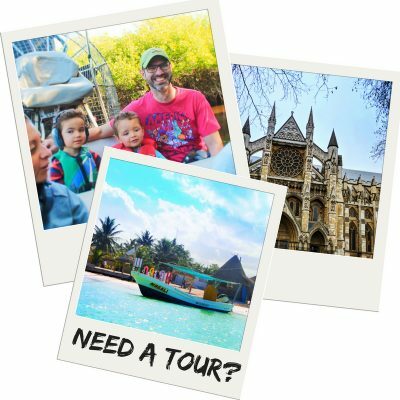 What I’ve discovered is that you’ll also find a small town with welcoming and warm locals and many family friendly activities. Vail is a scenic, breathtaking two-hour drive west of Denver. 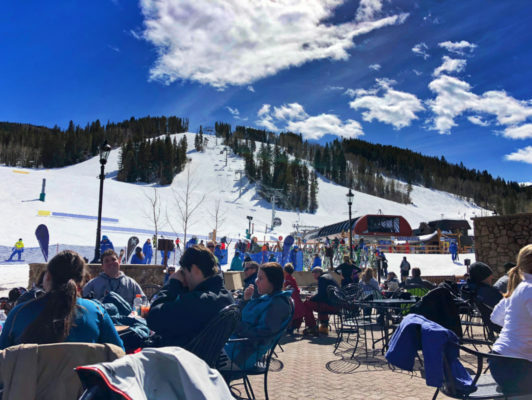 While Vail is well-known as one of the finest resort areas for skiing, you can’t discount the nearby towns and resorts of Beaver Creek, Copper Mountain, Eagle and Avon. Vail was founded as a ski resort in 1962 and incorporated as a town in 1966. Sitting at an elevation of 8,150ft it boasts 5,289 skiable acres and 33 ski lifts. 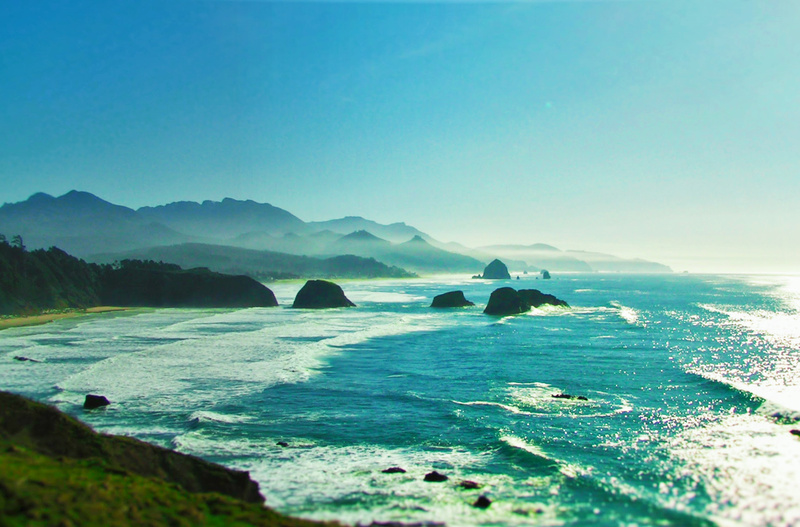 The sun shines for more than 300 days of the year and our recent seven day trip was no exception. The fresh mountain air is typically calm and relative to our homebase in Seattle, very dry. Brian was already in Vail skiing with his fraternity brothers the week before, so our daughter, Em and I flew separately direct from Seattle into Denver International Airport and rented a car. Unfortunately, rental cars are off airport, and requires a terminal to rental site via an airport shuttle. Negotiating oversized ski bags and a 3 year old is not easy, but the shuttle drivers were happy to help. While you can manage the 100 mile journey across the mountain ranges with a front wheel drive vehicle, I recommend an all-wheel drive car. 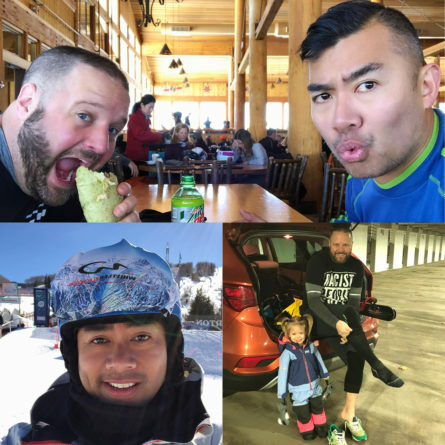 You need to pass two summits up to 11,000 ft on the way to the resort and while the weather apps may say it’s sunny in both in Denver and Vail, it can still be snowing in the summits. That was my drive, crossing into Idaho Springs on I-70E was windy, with snow coming down hard. Despite the fierce weather my toddler slept blissfully unaware of it all. Tip: book an all-wheel drive vehicle and be prepared to drive in some snowy conditions. Talk to the rental desk about snow precautions if you’re inexperienced or unfamiliar with the area. 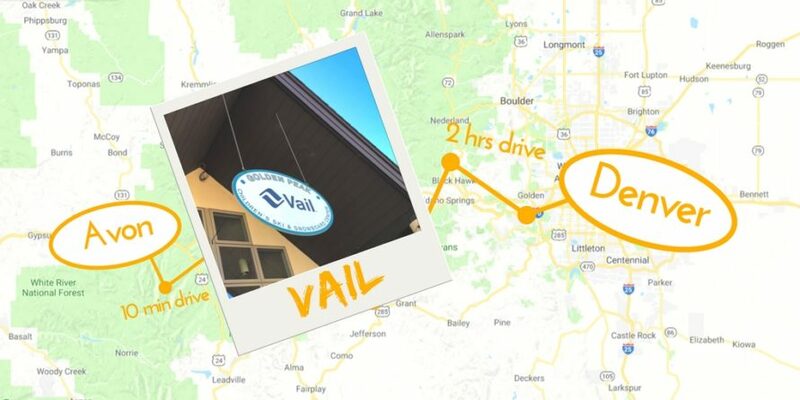 Alternative travel idea: If you don’t want to drive yourself from Denver to Vail, Colorado other options include flying directly into Eagle, CO via connecting flight on a smaller commuter plane, or you can take one of many private shuttles that go from Denver to the ski resorts. 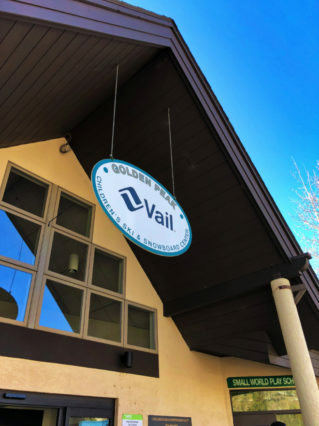 A variety of different accommodation types exist within Vail, from the resort-based hotels or even AirBnBs, to the established large hotel chains like Hyatt and Marriott. Where should you stay? Depends on where your priorities lie. 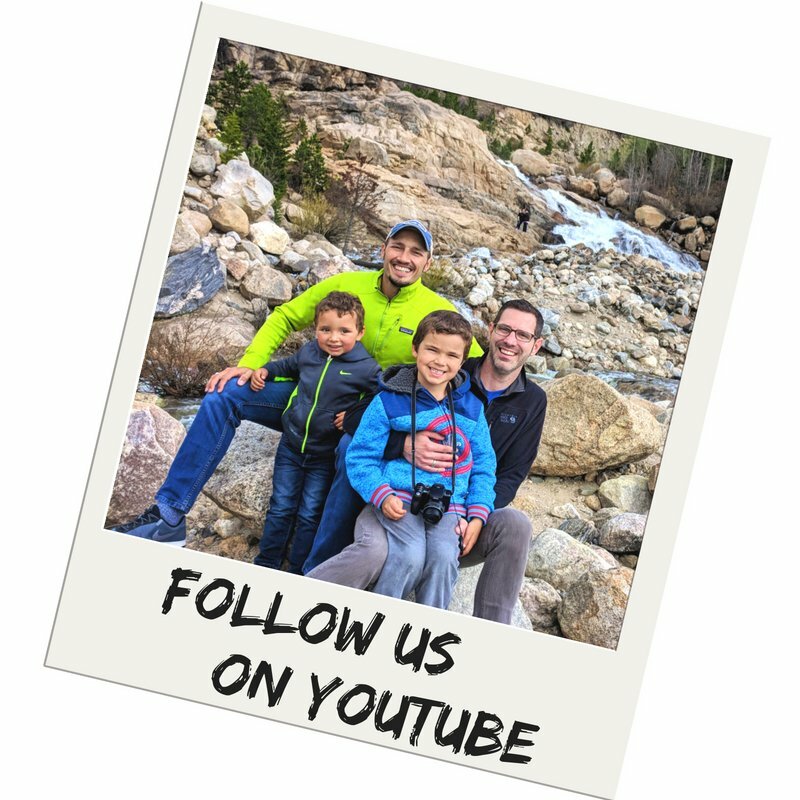 Since our stay was 6 nights, our primary drivers were proximity to the resorts, price, ability to prepare our own meals, a separate bedroom for our daughter, and availability of kid friendly activities. We elected to stay in the town of Avon at the Sheraton Mountain Vista Villas. 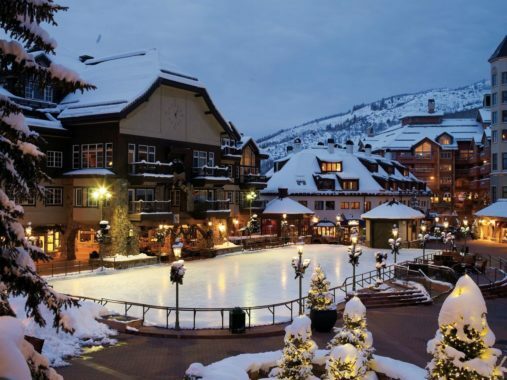 It is a seven minute drive to the ski resort of Beaver Creek and only 15 minutes west of Vail. 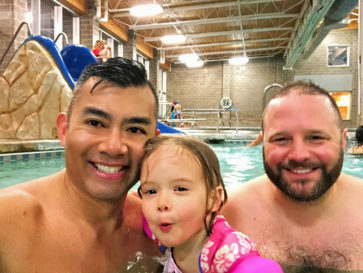 The Sheraton is a comfortable, family friendly hotel with an outdoor pool, three hot tubs, a ski store with equipment rentals, and a small café. Each day, the hotel staff offered a warm greeting and pleasant smile. From the cleaning staff waving to our 3 year old to the helpful and friendly café cashier, you felt pampered and it truly felt like a mountain home. The recently updated 1-bedroom suites are spacious and well equipped with a full kitchen, stocked with pots, pans, utensils, and dishes, plus a full fridge. There is even a grill on the balcony. If you don’t want to cook or make your own drinks, there is a hotel standard bar and restaurant on the main floor, plus many restaurants a short drive near the hotel. Ski Rental Tip: Unless you are looking to demo some high end equipment, if you need to rent skis, I recommend you use the shop in the hotel’s in-house shop and check the equipment in the ski lockers for the duration of your stay. The equipment they provide is very decent at a rate much cheaper you’ll find at the resort, plus you’ll save time when you return and check out. 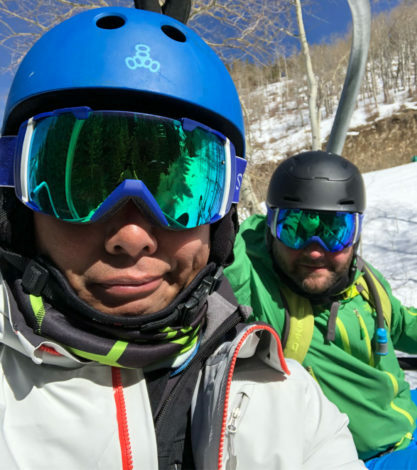 With two adults and a toddler, plus our ski gear, logistically it was a lot easier to drive to the resorts, however, there is a complimentary City of Avon shuttle to Beaver Creek. You can catch the shuttle just a short walk (even in boots) from the hotel entrance. Across the street there is the Avon Recreation Center, a perfect place to end after a day on the mountain. While the Sheraton has an adequate pool, your kids will love this rec center. For a small, reasonable fee, it boasts a warm-water lazy river, small wading pool with toddler appropriate slides and large Jacuzzi. For adults there is a full sized gym on the second floor and a 25-yard competition pool for lap swims. 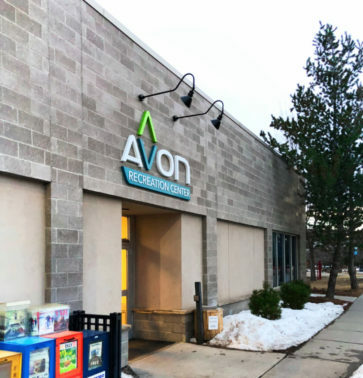 In addition, the Avon Public Library is nearby and a great place to explore and checkout some bedtime books. 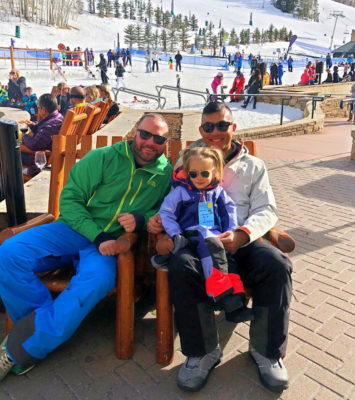 Family skiing may seem a bit daunting to new parents or to people that don’t ski often, so here are some things to consider, whether you’re skiing in Vail with the fam if you’re heading somewhere else for the first time. Take note: a little planning goes a long way. 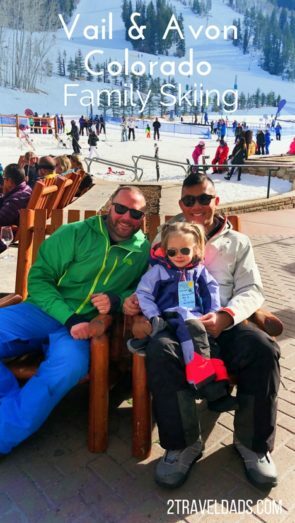 When we first came to Vail, our daughter was just 3 months old, so we found a nanny for a couple days while we skied. 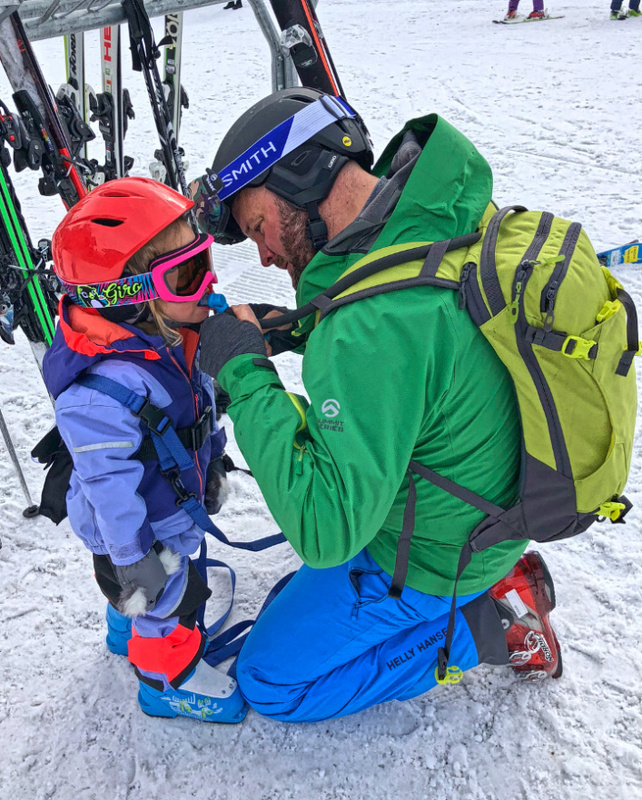 This year, Em was 3 years old and fully potty trained so we decided to enroll her into 4 days of ski school. 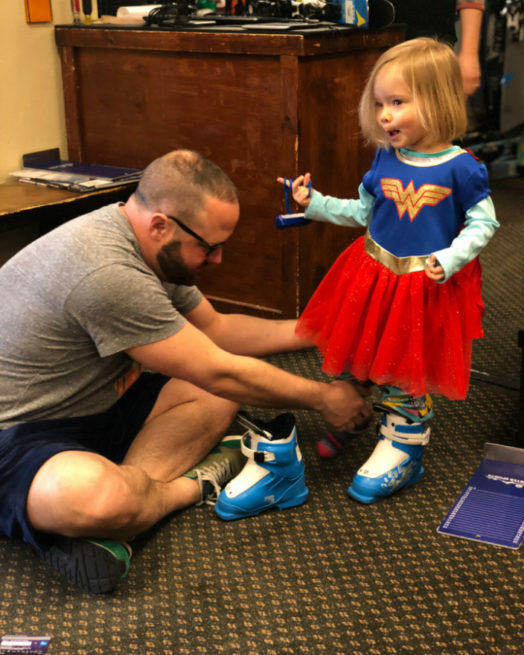 The curriculum gets toddlers comfortable with the equipment, the mountain and the basics of how to stop and get up from a fall. 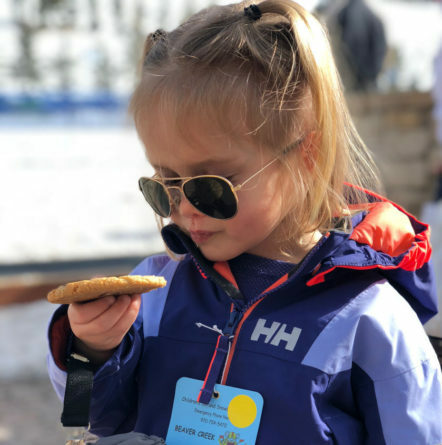 At this age, it is more important to get children to have fun in their gear and respect the mountain, than to conquer the biggest slopes, so don’t expect your kid to come out of the class as a mini Lindsay Vonn. Intake and drop off is at 9:00 am daily. 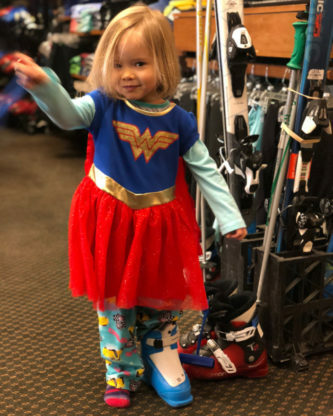 We definitely were in rush to get all of her equipment on (boots, helmet, goggles, ski outfit) and get there in time to sign all the paperwork, so give yourself plenty of time. It also helps to make reservations to ensure you secure your spot as they can fill up particularly on weekends. The kids spend some time inside getting to know their instructors and the class rules; they also are provided nutritious snacks and lunch. Once outside there is small magic carpet and a very forgiving and age-appropriate slope. Many of the instructors are either from Europe or South America and all of Em’s were patient, kind and had the energy required to keep 3 year olds interested for a couple hours. Em loved going to ski school, she insisted on going back the next day never crying or complaining at dropoff (though we did see a lot of that). 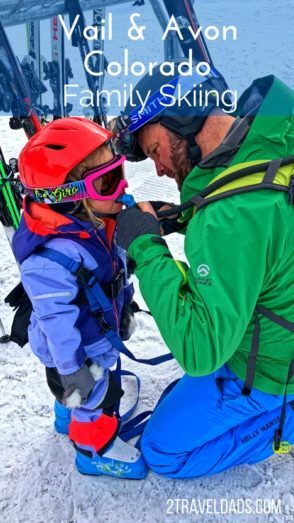 That could be due to the fact, she goes to daycare 3 days a week back home, but I highly recommend that your child’s first experience with skis and boots not be that first day of ski school and not on the actual mountain. 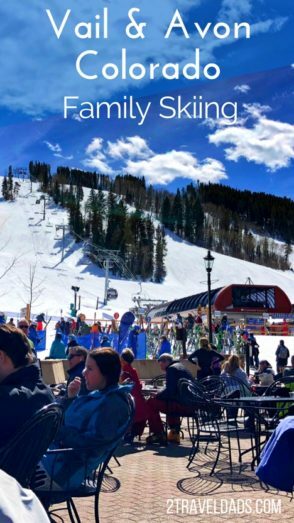 Both the Vail and Beaver Creek resorts have a ski school that are very similar to each other with respect to quality and the intake process. Keep in mind that Vail is much wider than Beaver Creek, so stay cognizant of the pickup time and how long it might take to make your way back to the Golden Peak area. The one day’s ski school costs about $225 for the full experience. To save some money you can book multiple days in advance. It lasts from 9:00 AM to 3:00 PM. It is customary to tip your instructor 15-20%. Now for the adult skiing. 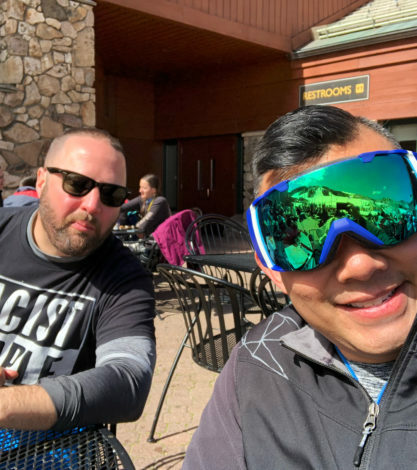 We hit up both Vail and Beavercreek during our 6 days stay. Vail is enormous with a variety of different runs and terrain that will satisfy the consummate downhill skier to the tree lovable snowboarder. 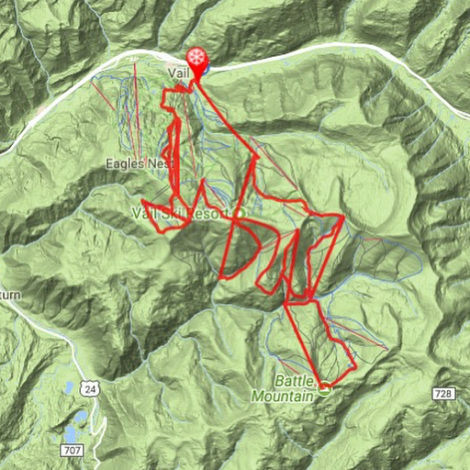 The best part of Vail is the variety of runs and terrain. With so many choices it’s a bit overwhelming and it’s best to create a plan about what type of runs are in your capability and for you and your partner. Brian and I both ski the same level, but where I prefer gladed, tree runs with lots of turns, Brian prefers straightlining (only straight thing he knows how to do!) down steep downhills. Tip: review runs/slopes and pick which ones you want to do during your time, especially if you’re limited on time. I grew up skiing in the Lake Tahoe Sierra’s and Vail is a bit counter-intuitive from where I grew up. Generally, the higher you go, the flatter and easier the terrain, so many of the greens tend to be at the higher elevations and the harder, steeper runs are mid-mountain or lower. Beavercreek is a bit more snowboarder friendly as it doesn’t require the same traversing across flat areas as with Vail. As the smaller of the two resorts, it usually has a little less traffic and lines than its larger neighbor. 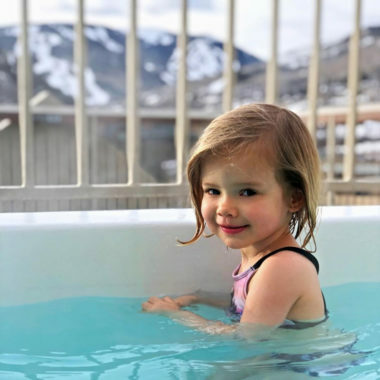 The self-contained village is also more manageable for walking and meeting up if you have very young kids who don’t want to travel too far in ski boots. Rosebowl is my favorite area and you can easily hit 50mph on a nice groomer day if you’re trying for speed. There are a variety of runs from steep moguls to gladed, tree skiing that all lead you down to this same bowl. For the less experienced and casual skiers, Larkspur is forgivingly wide, always groomed and generally soft as it faces the morning sun. My favorite blue run on the Larkspur bowl is Harrier. If you’re feeling brave, Birds of Prey and Grouse Mountain are designated as extreme terrain and are part of the resort’s World Cup series. Here, I waited until the afternoon sun hit it to avoid any ice and while challenging, it was wide enough to feel comfortable. Parking at Beavercreek is super easy from the Ford Hall garage, which leads you directly to the entrance of the ski school. Both of the resorts have a diverse set of food choices on the mountain and at the base. You can find anything from pad Thai to soup and salad, however, I highly recommend that you plan for lunch early at 11:00 am or late after 1:00 pm to avoid the lines and more easily find a seat. Food is expensive, even a simple burger can be more than $10. To save money, you can either bring your own packed lunch or better yet you can bring some steak to grill. Vail has complimentary gas grills at Blue Sky Basin and Henry’s Hut (across from the ski patrol building). Henry’s Hut has a little yurt where the kiddos can warm up while you’re working the grill. Tip: plan you skiing days to be able to enjoy lunch when it’s not crazy, so early or late, but not right at noon with everybody else. With the altitude and dry air, be sure to ease into your days slowly and stay as hydrated. It is common to get lightheaded and have headaches that first day of skiing. We were very cognizant of that with our daughter, encouraging her to drink lots of fluids and eating fruit. When she was a baby we would add extra water to her formula to ensure she was keeping up her fluids at the higher elevations. When your legs start to shake and get fatigued, it’s great to wind down with some family time at one of the mountain base sitting areas. You’ll find live music, beer, cocktails and free chocolate chip cookies handed out by the friendly staff in white uniforms and traditional chef’s hats. 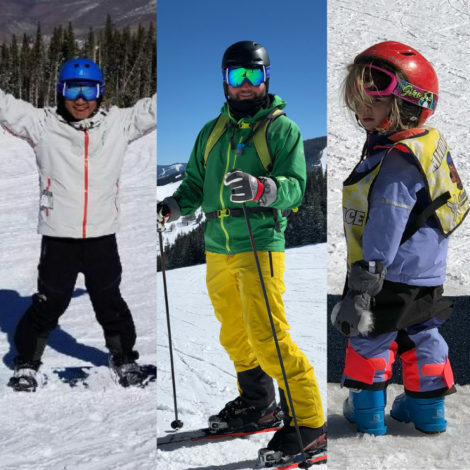 So, it may be a little late in the season at this moment, but now is the time to starting planning for family skiing for next season. If you have any questions or additional recommendations, please send us a message or let us know! 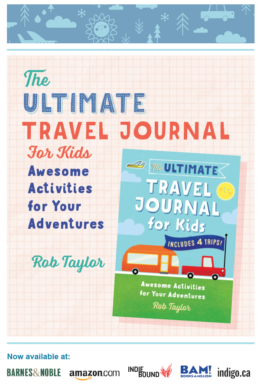 Want to pin this for your own travel planning to Vail, Colorado? Go for it!!! *This post contains affiliate links so we may get a small commision if you book it, at not additional cost to you. 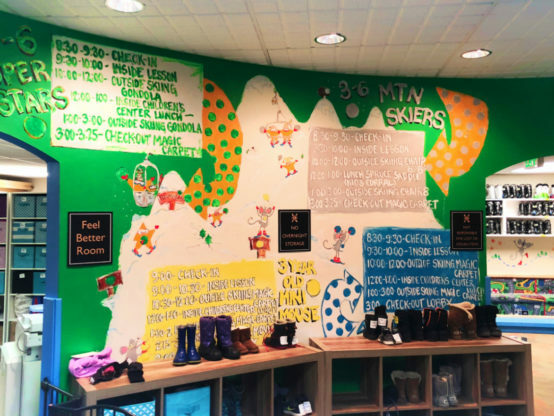 If you want to pre-arrange ski or snowboard rental book it here! or for hotel accommodations look for lodging here.